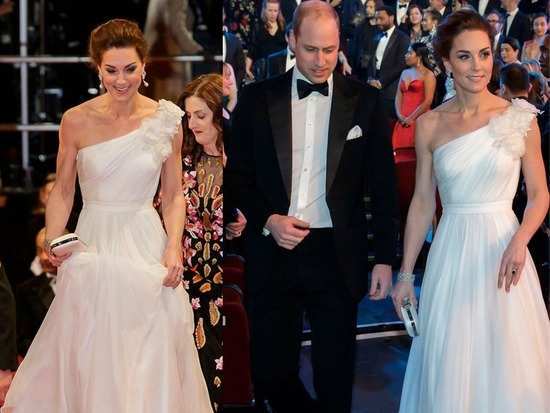 The Duke and Duchess of Cambridge celebrated their last evening with the stars from the film and television industry as the BAFTA Awards 2019 commenced. As the chief guests for the event, the royal couple, as expect was their sartorial best. However, we’d be lying if that Duchess Kate didn’t steal the show. As if out of habit, the Duchess chose an Alexander McQueen gown. The asymmetrical, pristine white gown had intricate flower detailing and was cinched delicately at the waist. Kate chose to pay homage to her late mother-in-law by wearing her tear-drop pearl and diamond earrings. She showed them off as she tied her signature bouncy locks in a romantic French bun. She's also thought to be wearing the Queen's diamond quatrefoil bracelet. She finished off the look with a pair of bedazzled Jimmy Choo shoes and a matching clutch. With classic smokey eyes and high-beam highlight, the Duchess was positively glowing throughout the evening. She rightfully embodied the modern day princess she is as strutted down the red carpet gracefully. In a fitted tux and a bowtie, her husband and the Duke of Cambridge, William did a thorough job in matching up his wife’s sophisticated glamour. 10Priyanka Chopra and Nick Jonas' latest pictures will make you want to head for a vacation!